Things that have changed my life include Jesus, movers, and homemade croutons. Seriously. Once you’ve made your own croutons, you may never eat the boxed variety again, provided you have the choice. As a single gal, I find it’s a great way to use leftover bakery bread. Am I the only one who is sometimes peeved that you can’t buy a mini-loaf of ciabatta or French bread?? 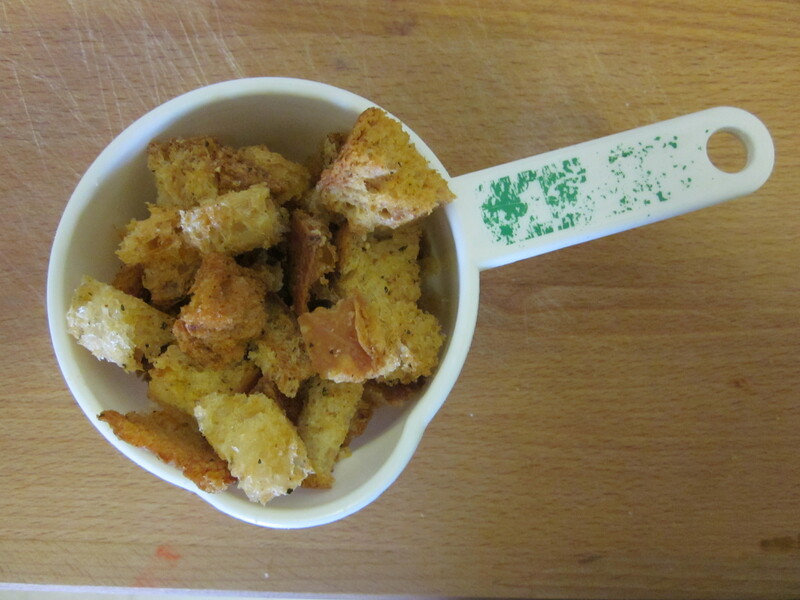 With the leftovers from a full loaf, you can make croutons so then nothing goes to waste, which is always good. 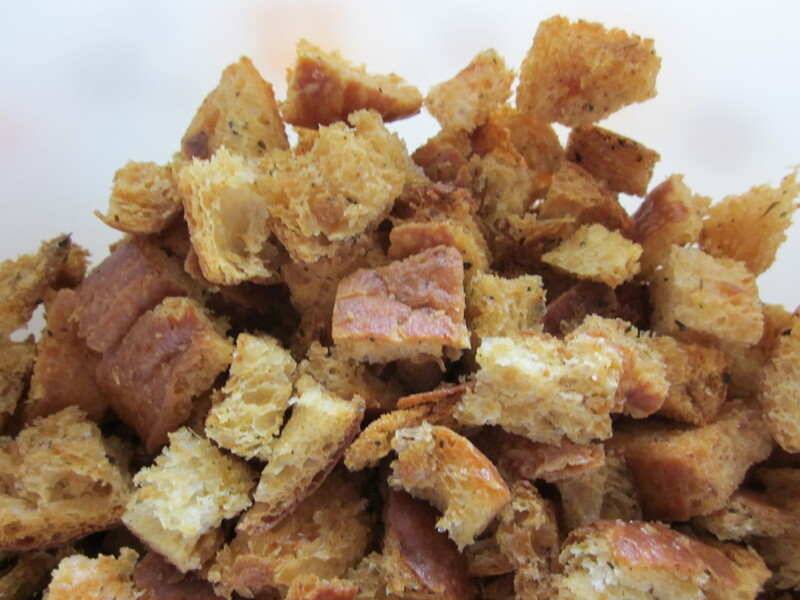 When you are making your own croutons, you can control the oil, salt, kind of bread used, and the overall flavor profile. I do love options, don’t you? Overall, it’s pretty simple to make the croutons, although I have made two different errors in the past that caused my croutons to burn. Take good notes, and I’m confident you’ll escape my burned crouton fate. 2. 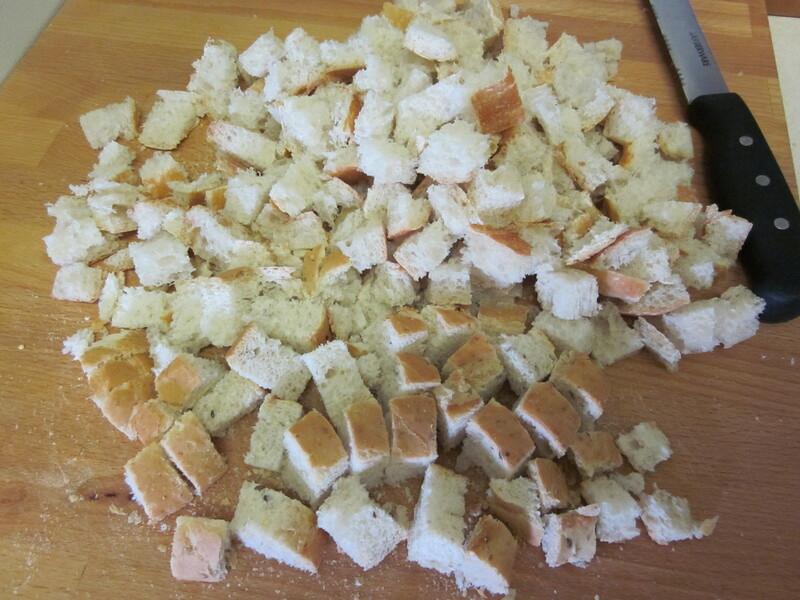 Cut bread into relatively uniform cubes so they will cook at the same rate, more or less. 3. 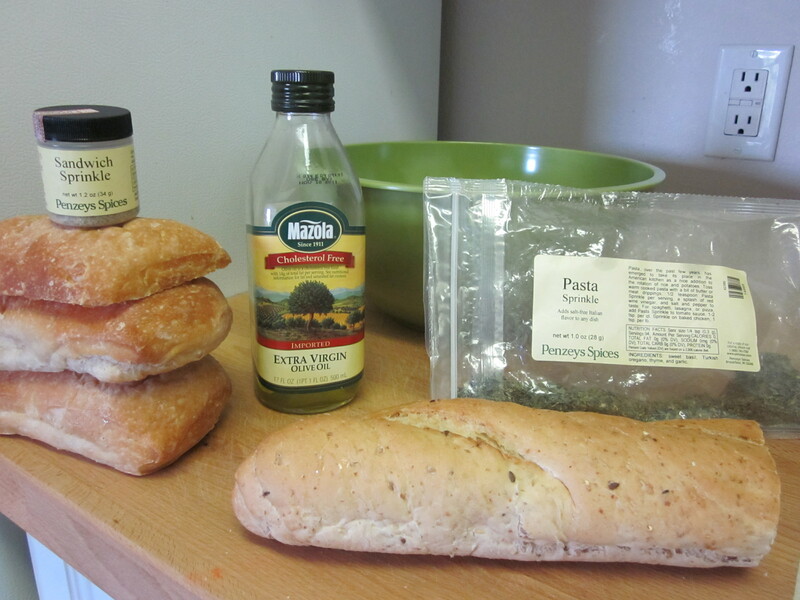 In a large, roomy bowl, combine your oil and seasonings, and then add your bread cubes. 4. Using a spatula, gently toss your cubes around so that the oil is distributed over the bread. 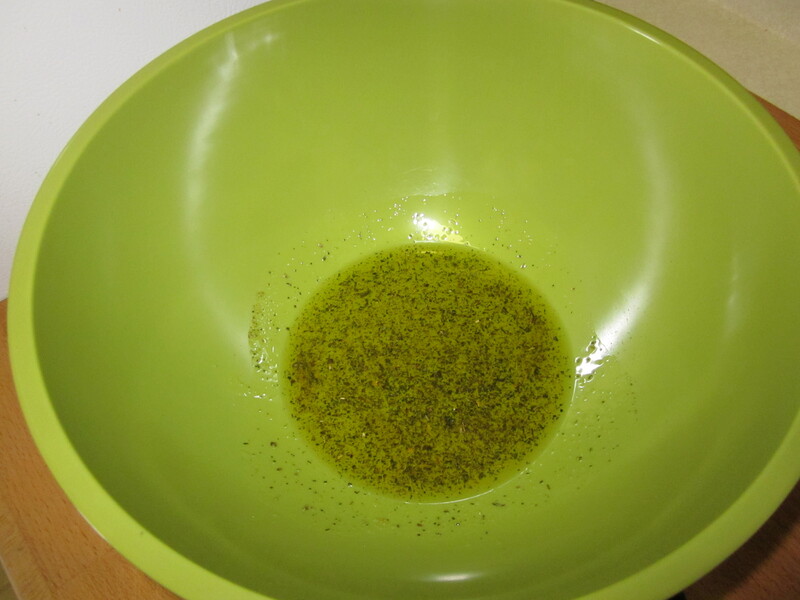 If you think you need more oil, drizzle some in along the edge of the bowl and keep mixing. 5. Spread them in a single layer on a shallow pan with edges. I prefer to line mine with foil as it assists with clean-up. 6. Cook for 3 sets of 8 minutes. Check and stir a bit after each set. You may also want to rotate the pan for even cooking. After 24 minutes of cooking, you have a personal decision to make. At this point, mine are my preferred level of doneness. However, you may prefer yours a bit more crispy or brown. If this is the case, continue to cook them in 1 or 2 minute increments until they are cooked how you want. I have two tips to help you avoid burned crouton territory. First, make sure your oven is set to 300. While 350 is the universal, default oven temperature, your croutons are not meant to cook at the default. I have a post-it on my cabinet with the skeleton recipe to help me remember the oven temp. Second, once the croutons have cooked about 24 minutes, if you choose to leave them in for more time, check back every 2 minutes or so. They will turn from delicious brown to dark brown to unfortunately black in a flash! Unfortunately, when you aren’t in the kitchen, a flash can happen even faster than you think it can. An alternate route is to turn the oven off after 16 minutes but leave the croutons in there with the door shut, and they will continue to crisp from the residual heat. Store your croutons in the fridge so they will last longer. I use mine in salads, thin soups, and sometimes just as a tasty snack. If you were tired of your particular flavor of croutons, you could give them a quick run through the food processor for seasoned bread crumbs which have a plethora of uses. I encourage you to use a bit of salt on your croutons, but play around with the seasoning options to find your favorites. I’m sure they will change your life, too. Happy eating! I totally identify with the desire for a mini-ciabatta! These look superb, Karen! I love, love, love homemade croutons. Everyone should make them. They will be pleasantly surprised at the upgrade from boxed. Pingback: Tomato Basil Soup « Let There Be Food!